Some of the best camping grounds in Sydney can be defined by what they don’t have. No games room, no heated pool, sometimes not even electricity. Instead, serenity. So much serenity. What you’ll find here are natural bush or beach camping sites, many with decent amenities (but that’s not guaranteed) and retro make-your-own fun in BYO tent or caravan. The most cited places came to mind first – Coolendel near Nowra, Bonnie Vale in Sydney’s own Royal National Park, The Basin (often confused with Bents Basin) – but there were others deserving more prominence, like Cockatoo Island (smack bang in the middle of Sydney Harbour), Crosslands near Hornsby, and Wombeyan Caves. A deservedly popular camping area overlooking Pittwater. The 20 minute ferry trip from Palm Beach will get you closer to the camp ground than driving (which would mean a nearly 3km walk to the site). Bookings essential via National Parks. Bents Basin campground has everything you need for a camping getaway near Sydney except powered sites. You can recharge your phone and dry your hair in the industrial style camp kitchen. It’s a well maintained and serviced campground with easy access to bush walks and water sports. Suitable for tents, caravans and camper trailers with hundreds of sites scattered throughout the bush and river front. Find out more. Bordered by Royal National Park and the Hacking River in Sydney’s south, Bonnie Vale Campground is ideal for bushwalking and water sports. With easy access to the Coast Track and Jibbon Aboriginal Carvings, Bonnie Vale also enables bushwalkers to turn the two day Coast Track into a three day traverse of Royal National Park. A large grassy campground with both bush campsites and beach camping, Bonnie Vale Camp ground has hot showers, flush toilets and free gas BBQs. Bonnie Vale has easy access to Cabbage Tree Basin and Simpsons Beach for swimming. You can also rent a kayak or standup paddle board and enjoy the relatively wave free beach near the campsite. Note: In September 2018, Bonnie Vale camp ground closed temporarily. Get the latest info here. This camping spot right near the Hawkesbury River is perfect for river swimming, fishing, and canoeing. On the Hawkesbury River between Richmond and Wisemans Ferry in Cattai National Park, Cattai Campground is well appointed with pretty much everything you need except power and firewood. Fires are permitted but bring your own wood. Enjoy a paddle or swim in the river, bushwalking or a big game of sport on the grassy expanse. Ideal for families or large groups. Expect kangaroos at brekky time. Bookings via National Parks. Cockatoo Island is a relatively unknown gem on Sydney Harbour. Sitting opposite the ferry wharf at Woolwich (with free all-day parking), the harbour island offers city and inner-west views. Cockatoo Island has bring-your-own tent camping or rent-a-tent onsite ‘glamping’. With hot showers, flush toilets and communal fridges and BBQs, it’s a perfect base to explore the well-preserved industrial history of the island or catch regular ferries to Circular Quay. Visit for the Biennale and other events. Bookings essential. Situated in a bend in Berowra Creek, Crosslands is a big grassy expanse with flush toilets and tap water. A good day’s walk from either Thornleigh or Brooklyn, Crosslands Reserve is on the Great North Walk that stretches from Sydney to Newcastle. The southern section of Crosslands is managed by Hornsby Council and needs to be booked in advance. The northern end, separated by the road, is National Park and no booking is required (yes, free camping near Sydney!). The council area has newer and cleaner toilets and is more popular with large family groups. The national park is more rustic and sees more small groups and larger Duke of Ed groups. Fires are permitted in the fire pits and minimal timber is supplied. Lane Cove National Park camping ground is the only caravan park in this list of best camping spots near Sydney. There's a children's play area and Lane Cove River is a great place to explore on foot with kids. There is also a swimming pool, hot showers, flush toilets, free gas BBQs and a TV and games room. It’s a comfortable day walk from the ferry at Woolwich if you are walking the first section of the Great North Walk from Sydney. You’ll pay around $50 per night for a tent site and pitch right next to Tandara, the $220 per night luxury camping experience. Bookings essential. Putty Beach campground has 20 sites with easy access to a kid friendly beach. There is surf at the other end of the beach but the campsite end is protected by a rocky headland that’s great for exploring with the kids too. Situated at the southern end of the Bouddi coastal walk Putty Beach campground has picnic tables, gas BBQs, drinking water, showers and toilets. Little Beach campground is at the northern end of Bouddi coastal walk and has toilets, a sheltered picnic area and gas BBQ. You’ll need to bring your own water and everything else. If you don’t mind a walk to find absolute beach camping near Sydney check out Tallow Beach Campground. It’s over 1km from the nearest carpark but its remoteness means it’s deserted. There are composting toilets and nothing else. Bookings through Bouddi National Park. A 200 acre secluded riverside camping ground on private land, with activities including horse riding and kayaking available at an additional cost. Fires are permitted; toasted marshmallows welcome. Plenty of camping options including bring-your-own tents, or glamping. Find out more. Lakeside camping means water sports and fishing are well catered for. Bookings via Singleton Council. Did someone say “free camping”? Singleton Council looks after McNamara Rest Area in the Hunter Valley. It's a fairly large campground, surrounded by bush, with basic facilities (picnic tables, rubbish bins and toilets). The large, flat grassy area means this camping ground is suitable for caravans as well as some good spots for tent-based camping. No bookings. Find out more. How amazing is the Hunter Valley? Known for it's vineyards, wine tastings and now… more free camping. This time, it's in the grounds of the Wollombi Tavern. No showers but there are toilets. Find out more. This little gem is off Bells Line Road. 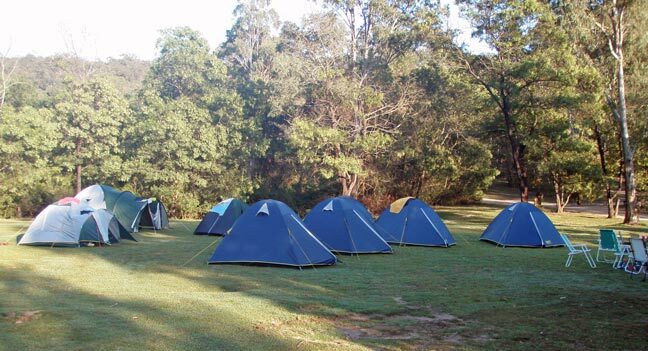 Cathedral Reserve is a lovely Blue Mountains camp ground, free for camping and no booking is required. There are composting toilets, tank water, fireplaces, picnic tables and garbage bins. You'll need to bring your own drinking water, firewood, and, um, toilet paper. This bush camping near Sydney is understandably popular. Find out more. The first campsite on the well know Blue mountains Walk, the Six Foot Track, Coxs River Campground also has car access. It’s on a bend in the Coxs River it is great for swimming and depending on recent rainfall is either knee deep or over head. On long weekends large groups of 4WD may descend on the campsite with generators and palatial tents. If serenity is what you’re after, pick your time carefully. Kangaroos and wallabys graze around the campsite and there are long drop toilets and tank water. No booking is required. Find out more via National Parks. Dunphys campground is a remote site located at the end of Megalong Valley in Blue Mountains National Park. It has toilets, BBQs and fire pits but not a lot of water. Dunphys campground has 2WD car access and provides great access for walks around Coxs River, the Wild Dog Mountains and on to Kanangra Walls. Free camping, no bookings required. Find out more via National Parks. Euroka is in Blue Mountains National Park and has a variety of campgrounds with picnic tables and wood BBQs. There are fire pits that you’ll need to bring your own wood for and you’ll be sharing your campsite with kangaroos. The Fern Glen Walking Track will take you down to the Nepean River and the Nepean river Walking Track. Red Hands Cave and Jellybean Pool are not far away. Reservations required via National Parks. The closest campsite to explore the Glow Worm Tunnel at Newnes and the pagodas of the Wolgan Valley. Check out the remnants of the shale oil mines on the Newnes Industrial Ruins walk and mountain bike the Bicentennial Trail. There are no flush toilets and you’ll need to bring your own drinking water or treat the water from the creek that runs through the campsite. Bring your own wood for fires too. It’s a free campsite near Sydney. Therefore it’s first in first served and fills up in school holidays. Find out more. Alongside Megalong Creek, Old Ford Campground is not far off the Six Foot Track and just down the road from Megalong Valley Tea Rooms (it gets a mention for their morning teas…). A bush campground with composting toilets and tank water, it’s not the most level camp site so popular with caravans, camper trailers and smaller tents. Find out more. Another seriously popular campsite on the inside bend of a river (there’s a trend here), Bendeela is the perfect base to explore the Kangaroo River. A large grassy expanse with room for everyone, this used to be quite rustic with rudimentary toilet facilities. Managed by Water NSW, camping is free. Find out more. Probably the best camping spot near Sydney for surfers who need vehicle access. Coledale campground is separated from the beach by a grassy bank that is perfect for a family game of cricket or footy. It’s a patrolled beach so swim between the flags in summer. An inlet at the northern end provides a great place to build sandcastles. Managed by the local Surf Lifesaving Club, this is a camping ground (with hot showers) literally right on the beach, with a minimum booking of two nights in ‘swim season'. Bookings essential. Coledale Camping Ground. The beach is at the left, the escarpment is to the right. Coolendel is a huge grassy campsite on a tributary of the Shoalhaven River with friendly wombats sniffing around your tents. Open fires are permitted and you can hire canoes or just swim in the cascades that flow past. There's also a volleyball court for a bit of competition with your mates. It's 52 acres of pristine bushland near Nowra. Bookings essential. Close to the “whitest sand beach in the world” Honeymoon Bay is a small horseshoe shaped inlet on Jervis Bay. The flat sand and dirt campsites are popular with Wicked Campers but are also good for tents if you lay a groundsheet underneath them. If you’re a kayaker it’s provides perfect access to Jervis Bay and the ocean. Usually camping is offered on a first-come, first-served basis, but there is a ballot system during the NSW school holidays. Find out more. Killalea Park is often referred to as “the Farm”. There is a bunk house for large groups, and plenty of unpowered, grassy tent sites. Bookings essential. Explore the nearby Wombeyan Caves system, then enjoy hot showers and toasted marshmallows at night. Managed by National Parks, it's not possible to book a tent site in the unmarked area, but bookings are essential for caravan and trailer bays. Find out more. This section contains affiliate links, meaning we may receive a small commission if you make a purchase. It helps keep this website running, so thank you. If you need more inspiration for places to camp further away from Sydney, grab this book, Camping Guide to New South Wales. What's a camping trip without good food? The ever reliable Women's Weekly does their take on Food for Camping.